SRC may be caused either by a direct blow to the head, face, neck or elsewhere on the body with an impulsive force transmitted to the head. SRC typically results in the rapid onset of short-lived impairment of neurological function that resolves spontaneously. However, in some cases, signs and symptoms evolve over a number of minutes to hours. SRC results in a range of clinical signs and symptoms that may or may not involve loss of consciousness. Resolution of the clinical and cognitive features typically follows a sequential course. However, in some cases symptoms may be prolonged. 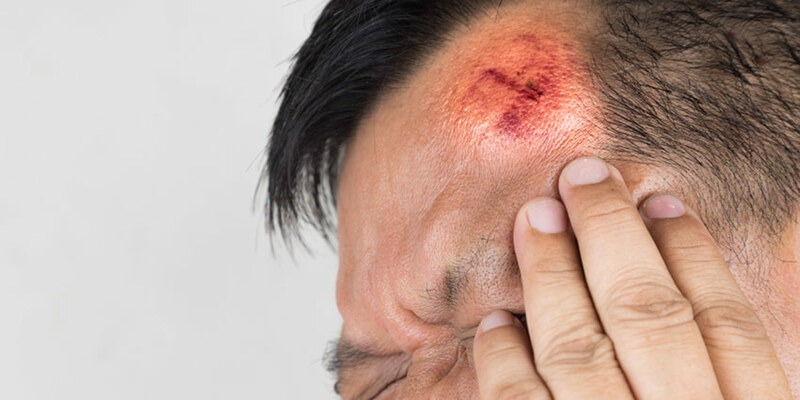 The clinical signs and symptoms cannot be explained by drug, alcohol, or medication use, other injuries (such as cervical injuries, peripheral vestibular dysfunction, etc) or other comorbidities (eg, psychological factors or coexisting medical conditions) (McCrory et a., 2017). The most common health professional looking after athletes in New Zealand are physiotherapists. Diagnosing a concussion on the sideline is difficult. People who sustain a sports related concussion are often not willing to come off, even if they know it may make their concussion worse by playing on. Although sideline video review may improve recognition and removal from play of athletes who have sustained significant head impact events (Patricios et al 2016), most recreational sports settings do not have this luxury. The Sport Concussion Assessment Tool 5th Edition (SCAT5) is the latest in the concussion assessment tools released after a consenus development process at the 5th International Consensus Conference on Concussion in Sport, held in Berlin, Germany, in 2016. This can be used by medical professionals to assist in the diagnosis of concussion. The child SCAT5 has been developed to assess brain injury in children between the ages of 5-12. 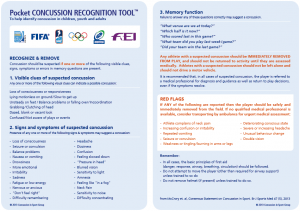 The Concussion Recognition Tool 5 (CRT5) was also developed to help non-medically trained individuals for the identification and immediate management of suspected concussion (Davis et al 2017). The Concussion Recognition tool is shown below, and it describes symptoms of concussion and has advice to follow for people who suffer a concussion and their caregivers. In New Zealand managing concussion in the sporting context is improving, New Zealand Rugby has been running their Blue Card system since 2014 in Northland, and it has been rolled out through the rest of the country. If a referee sees a player sustain a head knock and demonstrates symptoms of concussion they issue the player a Blue Card. The player must leave the field and cannot return to the match. The player also has to follow set graduated return to play guidelines and be cleared by a registered doctor connected to the Provincial Rugny Union before they can return to contact training. More information on the Blue Card System can be found here. Currently in New Zealand only a qualified medical doctor can assess and diagnose a concussion. Physiotherapists can complete the SCAT5 however we are not able to diagnose a concussion, or refer to ACC’s Concussion Service. Sport Physiotherapy New Zealand is running a series of education seminars across the country designed to educate Physiotherapists on the management of a concussion when it happens, and on the graduated return to sport process. Physiotherapists are able to help people who have sustained a concussion return to work, sport and school safely. They are often able to oversee the progressive, graduated programmes that can help test the cognitive and physical symptoms that can result from concussion. These can include exercise prescription, vestibular or balance retraining….but they cannot clear a person to return to contact sport. I believe there is a case to allow appropriately trained physiotherapists to be able to diagnose and refer to the ACC concussion service. I also believe all physiotherapists should ensure they are well trained in recognising the signs and symptoms of a concussion and have a good referral network of providers that can work together to optimally facilitate a return to safe work, sport or school.